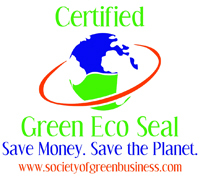 Value machinery is certified as a green business. Our ongoing efforts are to conserve energy and water while minimizing waste. We believe strongly in being kinder to our environment and encourage the companies we work with to do the same. The manufacture of the thread we sell is also environmentally proactive and is always looking into additional ways to become more environmentally friendly. For more information regarding our green program please contact us, we will be more than happy to supply you with information.